darnkitty.com - Problems with Java? UPDATE November 2017: You will probably need to download Internet Explorer to play the Java games. Unfortunately, the makers of Firefox and Chrome have stopped support for Java. That means if you're using the latest version of either of these browsers, you won't be able to run the Java games. It's extremely rude, if you ask me. Fortunately, those of you using Internet Explorer or Safari should still be able to access the Java games. For more information... Chrome users: click here, and Firefox users: click here. "Your security settings have blocked a local application from running." With every release of Java, they have tried to make it more and more secure, almost to the point where it won't let you run anything anymore. With the latest Java update, you have to perform the following steps to run Java games on this site. 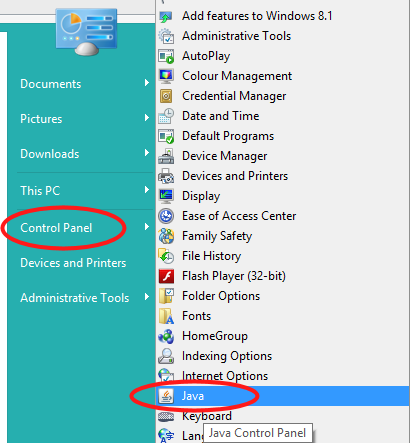 Click Start -> Control Panel > Java. 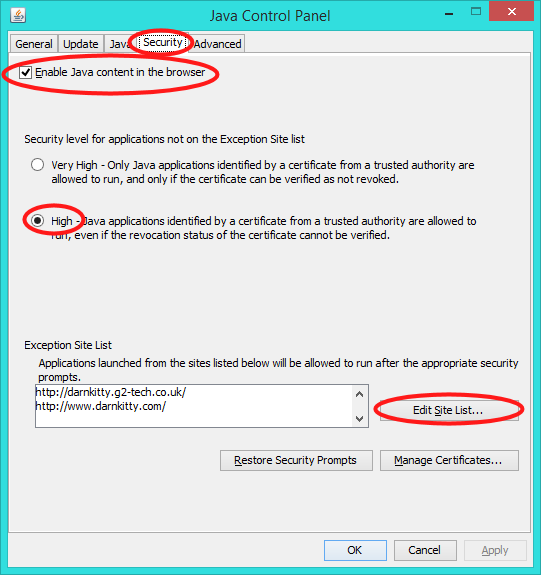 Ensure that "Enable Java content in the browser" is ticked. Click "High" under the "Security Level..." heading. 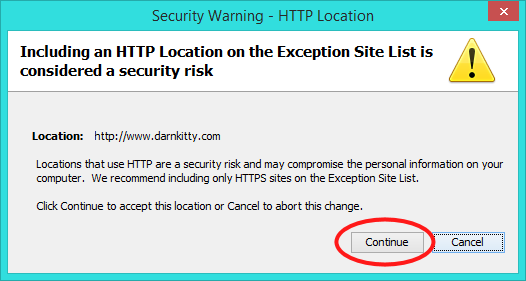 Click Add, and add http://www.darnkitty.com/, ensuring you include the http://. Click Add a second time, and add http://darnkitty.g2-tech.co.uk/. You may get the following warning - if so, click Continue to dismiss the warning. If your browser was open, please restart it and try again.